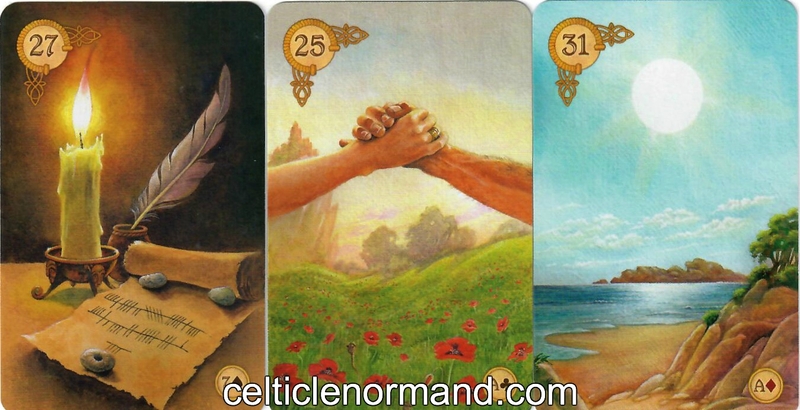 The Celtic Lenormand Oracle: What Does Success Look Like? We all have different things going on in our lives, different notions of success. And yet, one of the beauties of spells is that they can speak to many different desires. Take the spell above. I created it because I have a contract to sign this week. It's a big contract, important to my future, and I want it to be a positive force in my life. Combining documents, commitment, and success (Letter, Ring, Sun) seemed like a way to keep it simple and express exactly what I am working towards. Keeping it simple is actually another part of what I want for this contract. Not always easy when lawyers get involved! And yet, despite its simplicity, or perhaps because of it, this spell can be used for so many situations: buying a home (you could add in the House); signing a new work contract (add the Anchor, or your preferred work card); journaling; tracking a daily commitment like exercise (add the Rider or the Birch Rods); writing a letter of intent; renting a car (add in the Ship); it could even be used by a writer to help them with something like NaNoWriMo, where they commit to writing a certain word count every day! I hope your spell will bring you the outcome you hope for. Thanks, Ellen. Should know by Friday... Do you have something you want to commit to right now?